The monitor of a computer is the visual output of a computer. It is also referred to as the computer "screen", the "display", or the "terminal". It is often mistakenly referred to as the computer itself, which is actually a composite of usually the CPU and RAM. Three monitors featuring the old Windows startup screen. A monitor displays what is processed by the computer to which it is connected. It is similar to a television, but the primary difference between the two is that use of a computer is not entirely dependent on signal reception. 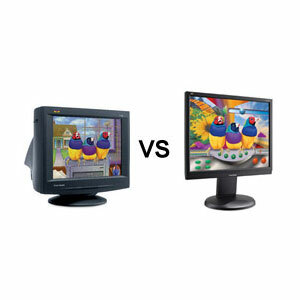 Most monitors use one of two display technologies: CRT (Cathode Ray Tube) display, or LCD (Liquid Crystal Display). Both LCD and CRT monitors display images with proportions of Red, Blue, and Green, otherwise known as RBG. CRT on the left, LCD on the right. CRT is the older of the two systems, and it had been used in televisions before its development for computer monitors. Cathode ray tubes were invented in 1897 and were used in most computer monitors until the early 2000s. With a cathode ray tube, a stream of electrons could be directed at the phosphors on a CRT screen to project images. CRT beams can be interfered with using a magnet, which can be a serious issue for some computer owners as this type of damage to a CRT is irreversible. Instead of firing electrons at the screen, a Liquid Crystal Display uses a backlit screen on which certain pixels are illuminated. LCD technology has largely replaced CRT in most of the developed world, although many parts of the world still use CRT monitors. The purpose of a monitor is to allow computer users to "interact" with the inside of the computer. Because the monitor is the window into the computer's systems, most monitors (when connected to a computer) will display information such as available system updates, power level, available storage, and internet connection. The desktop toolbar on a Mac computer monitor.